Often, higher ed institutions resist public-private partnerships (P3) due to one fear: Loyal employees will not be taken care of during the transition. The truth? There’s no need to worry. 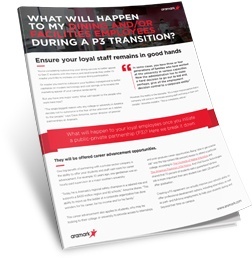 What will happen to your current employees once you initiate a P3? We break it down in this short guide. Will staff members be let go? What about benefits and wages? Is there room for career advancement? How is full efficiency achieved? Get the answers you need. Get your guide today.